O’Sheas again sponsors winners at MIFGS 2014 Ian Barker and his team picked up a silver medal at this year’s MIFGS with his display called “Left-overs”. A brilliant use of an old shipping container as a ‘pop up’ café for the display, showed that “left-over” spaces in the city, perhaps with “left-over” objects on them, can be easily transformed into attractive feature gardens. The ‘pop up’ café opened onto paved areas with small group seating, surrounded by lawn and naturalistic perennial planting, making it an inviting place for people to meet and socialise. Well done Ian and team! Also Lisa Ellis won a gold medal in the inaugural Boutique Gardens competition with her “Midnight Garden”. 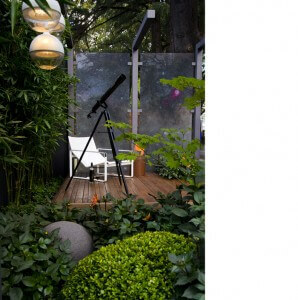 Lisa’s exhibit cleverly brought together the age old pursuits of star gazing and garden design. The four elements of earth, air, fire and water were represented in the garden. Staggered pergola beams framed the space, yet opened up a view to the stars. A black pond reflected the night sky and the pendant light fittings referenced the moon and planets. Concrete spheres were placed in the garden to align with a constellation in real time.